All our seed orders are in and now packages brimming with seed packets are arriving pert near everyday. Our table has been buried for quite some time now in a thick mantle of books, notes, calendars, charts. It’s seed season, our minds are racing with numbers, and our hearts are full of hope. We’ve got seeds on the brain these days and are extra specially looking forward to the very first annual Spearfish Seed Swap in a couple weeks. Mark your calendar: Saturday Feb 22nd, 2:30-5PM at the public library. To celebrate the occasion and help muster enthusiasm for the joy of seed saving, I’ve put together a few words on saving tomatillo seed. How to save tomatillo seed. 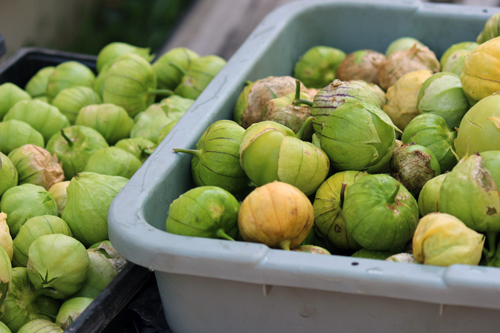 Pick out the very best looking tomatillos from your most healthy, strong, vigorous open-pollinated tomatillo plants. Open-pollinated varieties produce offspring that is true-to-type, versus hybrids where the next generation may not exhibit the same characteristics as its parents. We usually pick from 4-5 of the top tomatillo plants in order to help ensure some degree of genetic diversity. You’ll know the tomatillo is ripe, and the seeds are ready to collect, when the fruit has filled out the paper lantern wrapper and the paper begins to split/dry at the base. Remove the wrappers. Cut up the fruit into wedges and pop them into a blender. 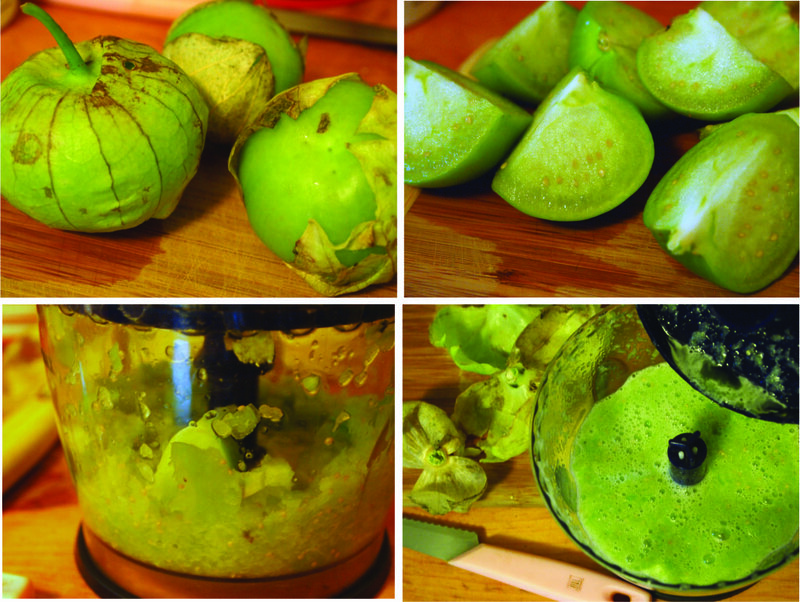 And gently bbzZzzZzzzzz them up into a cheerful, bright green tomatillo slurry. The seeds are small and robust and won’t be damaged by the blade. Then pour this slurry into a tall container and add water. I would suggest using a clear glass or mason jar for this, so you can see what’s happening. Mix this up with a spoon or chop stick. The good, viable seed will sink down to the bottom of the container. 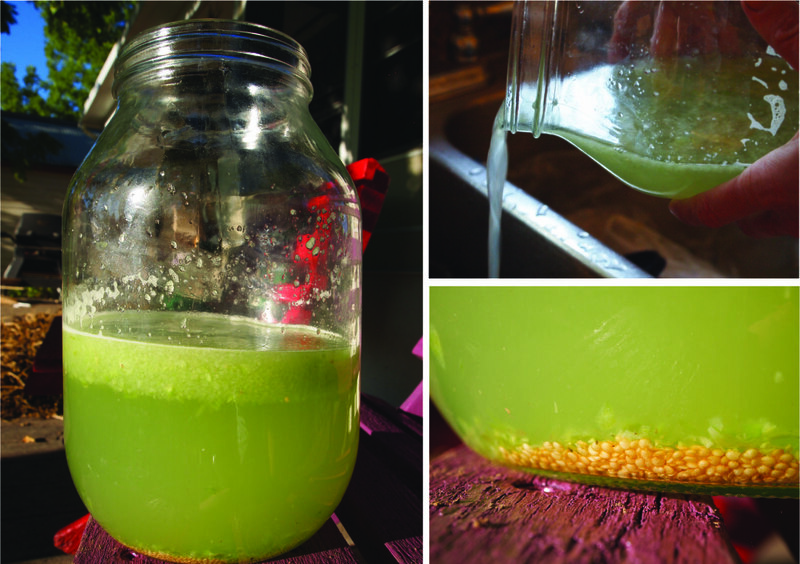 Pour off the floating green slurry and any floating seeds, adding water and pouring again until the water is clear and the seeds at the bottom are all that’s left. Then sieve out the seeds and lay them out evenly on a coffee filter or thin cloth. Let the seeds dry in a dark place, with good air circulation. Be sure to fuss around with them a bit while they are drying, mix them up so they don’t dry all stuck together. When they are all dry, seal them up in an air tight container and store them in a dark spot. You’ll know they are dry enough for storage when the seed breaks instead of bends under pressure. Just pick one out and bite it, if it’s bendy or soft, let them dry out more. Also, very important: label your seeds! Make sure you keep track of the seed variety and date grown. Another very important: Share your seeds with neighbors and friends. See you at the Seed Swap! This entry was posted in farm update and tagged open-pollinated, saving seed, seed swap, seeds, tomatillos by Cycle Farm. Bookmark the permalink. It is February and the time when I LONG for spring every year. Seeds say spring is coming more than anything. Wish I could be at the swap. Save me something unusual! do you have to dry out the tomatillo seeds or can you use them after you clean them up. I’m ready to plant now. They should grow just fine – the reason to dry them out would be for good storage for planting next season.